The idea of negative capability ran through the Jane Campion workshops and I've thought a lot about it since, linked to her suggestion that we learn a poem a week. On the set of Bright Star, she told Whishaw that for her poetry means 'openness to the divine'; her films open us all to that possibility that such a realm might exist. 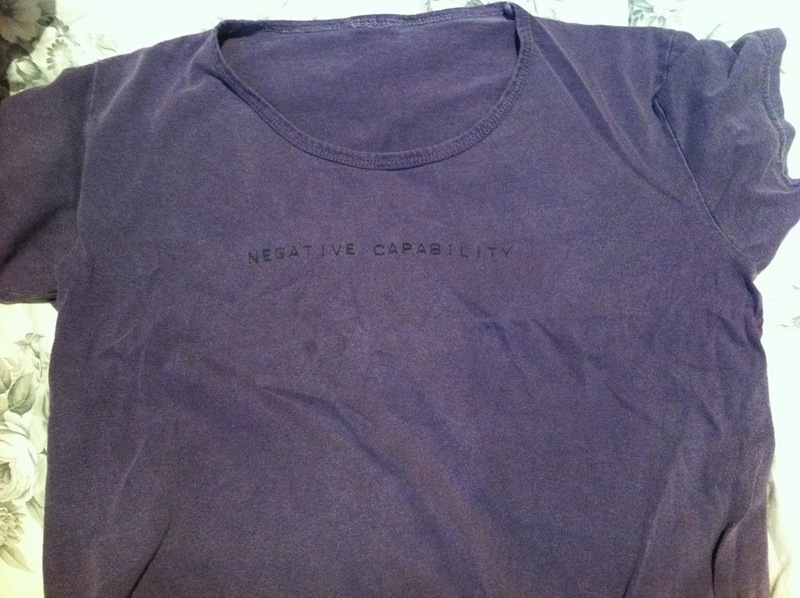 This post is for those like me who lack basic info about negative capability. And it started on Facebook. 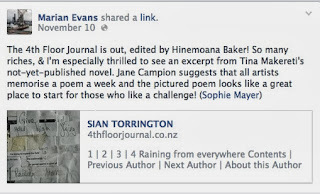 Now that the world's celebrating Lorde's writing, music and performance and Eleanor Catton's Man Booker Prize it'll be no surprise to you to see LOTS of interesting poems (and prose) by women, in the latest edition of New Zealand's 4th Floor Journal edited by poet + + Hinemoana Baker, about to spend a year as Writer-in-Residence at the International Institute of Modern Letters at Victoria University of Wellington. And as I thought about Jane Campion's weekly poem-off-by-heart idea I was intrigued, as you can see, by 'Raining From Everywhere' by Sian Torrington, who 'until recently described herself as an artist who writes but is currently coming out of the closet as a writer'. 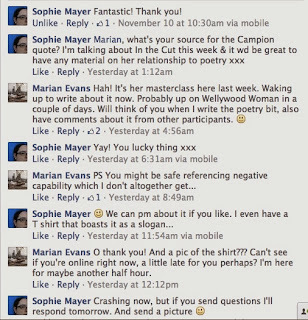 And I tagged Sophie Mayer, because like Sian Torrington she too is a poet and a queer (who writes for Chroma), as well as an academic, author of The Cinema of Sally Potter: A Politics of Love and co-editor (with Corinn Columpar) of There She Goes: Feminist Filmmaking and Beyond. And then we had a little chat that included reference to negative capability and my ignorance of it, which ended just before a friend came over and also explained negative capability. 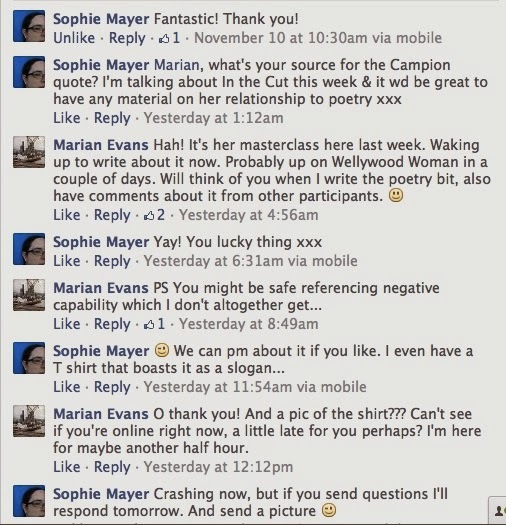 So, a warm welcome to Sophie Mayer. It's Keats' formulation in a letter dated 22 Dec 1818 (I'm sure you've found this out or know it already, but it's good to have a run-up). It's how he describes what sets apart literary genius. And it's not easy to define, because he then lists a whole bunch of things. 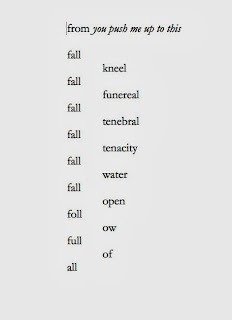 This in turn – via the range of formal devices demanded to create and maintain such a dwelling in possibility – creates or draws readers/viewers who are 'camelion,' willing to enter into sympathetic communion with characters, narratives and meditations. Rather than being directive or didactic, for Keats the best art creates a space in which 'uncertainties, Mysteries, doubts' are present, soliciting the audience's 'negative capability' to engage with them aesthetically and ethically. In the 60s, American artists after John Cage turned to Zen Buddhism and the koan for similar reasons. The Jack Kerouac School of Disembodied Poetics at Naropa, a Buddhist university in Colorado, uses Negative Capability as its slogan for exactly that reason -- but also because while seeming to mean something close to Bart Simpson's resistance to education and achievement (i.e. : I'm capable of nothing) it means the opposite. Being capable of holding a negative space of both imaginative sympathy and a comfort in paradox, rather than reaching for positivism's dual myths of progress/forward motion and perfectibility/closure, is still not either valorised or common in mainstream culture. Interestingly, Dziga Vertov suggests something similar about film in his concept of the interval, where he argues that the viewer's experience of the film (and thus its meaning) is actually constructed in the interval, i.e. : the black leader between celluloid frames, the gap between the images that provides the illusion of movement and offers a space for contemplation and interpretation. 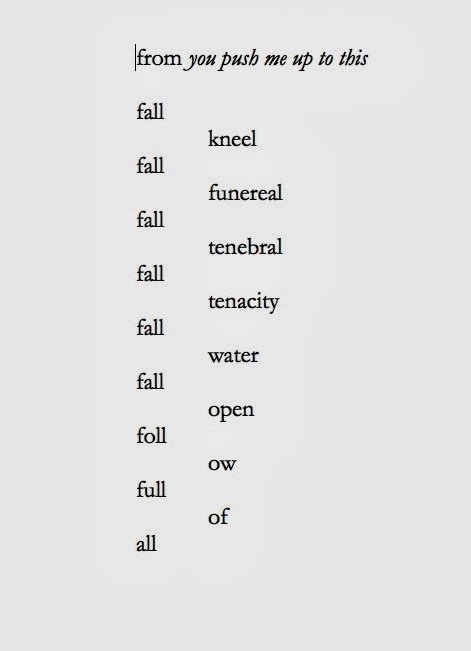 Not sure I have a poem that exemplifies negative capability specifically, but I'm attaching a part of a serial poem written in response to Top of the Lake that is certainly about the reader's imagination working in the gap and being capable of uncertainty! Should be quite easy to learn by heart as well. (My enquiries continue. As I try to wrap my head and heart around negative capability and relate it to what I know – especially my 'irritable reaching after fact and reason' – I'm very grateful to Sophie; and to my mate. I love the connections you made in this post. I've been thinking about 'negative capability' with regard to the creative process since class and this quote by filmmaker and feminist cultural theorist Trinh Minh-ha came to mind: "What is involved is a state of alert in-betweeness and 'critical' non-knowingness, in which the bringing of reflective and cosmic memory to life -- that is, to the formlessness of form -- is infinitely more exigent than the attempt to 'express,' to judge or evaluate. (When the Moon Waxes Red: Representation, Gender and Cultural Politics, 1991, p.234). Lots for me to think about and relate to what I feel... Tx again!